When three actors are mistaken for real gunfighters, they are asked to come to Santa Poco, Mexico for what they believe is simply another performance. Once there, they soon realize it isn't an acting gig at all, but a real life showdown with the most dangerous bandits of the region known as El Guapo (Alfonso Arau). Directed by John Landis, "¡Three Amigos!" is the hilarious comedy western starring three fantastic comedy actors, Steve Martin, Chevy Chase, and Martin Short. This trio of actors plays a trio of actors in the silent film era named Lucky Day, played by Martin, Dusty Bottoms, played by Chase, and Ned Nederlander, played by Short. They have starred in many films underneath the "Three Amigo" series moniker, but have recently been fired by their studio head. A young woman from Santa Poco, Mexico named Carmen, played by Patrice Martinez, sees one of their pictures playing in her local church. Santa Poco has been terrorized for years by a bandit known as El Guapo, played by Alfonso Arau. When Carmen sees the film and thinks that the movie is real, she quickly sends a telegram requesting the Three Amigos come to Santa Poco to put a stop to El Guapo's reign of terror. The Amigos mistake this telegram as an offer for an acting gig which is great for them considering their recent termination of employment. 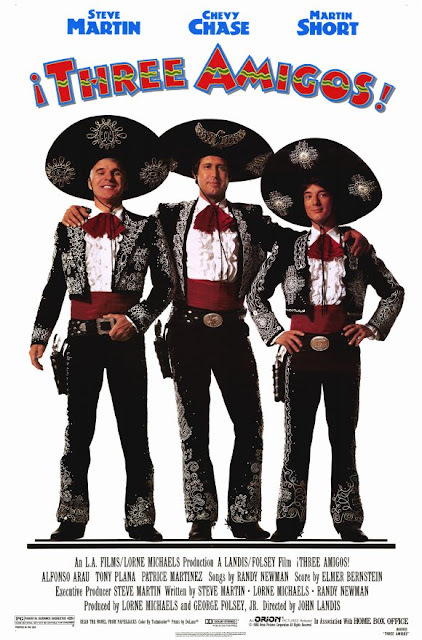 BigJ and I were absolutely shocked to see "¡Three Amigos!" has a 44% on Rotten Tomatoes. We know these older comedy films aren't the most well received, but 44% is a mere pittance compared to what it deserves. He and I both remember growing up watching this film, and we thank our wonderful parents for allowing us to be exposed to this kind of comedy early on. Watching this movie in 2016 for the first time in years, we still love it. It's a bit of a spoof on old western films, but not a parody of any single one in particular. The comedy here, though sometimes silly, is loaded with tons of witty dialogue and the occasional awkward fish-out-of-water scenario. A lot of what happens on screen seems absolutely stupid, but it all has an underlying level of brilliance to it, something that watching as adult we've realized more and more over the years. It's also extremely quotable, and to this day, we find ourselves referencing one its its lines in common parlance, regardless of what crazy looks it garners from people who have no clue what we're talking about. No matter, we know. This comedy works so well, and that's because of the comedic talent of its three main actors. The chemistry between Steve Martin, Chevy Chase, and Martin Short and their ability to play off each other works like a charm and fits like a glove. Each of these three actors is so charming, we can't help but love them no matter how stupid or oblivious their characters are. "¡Three Amigos!" has been out for 30 years and we've seen it at least a few dozen times, yet we always find ourselves coming back to its awkward scenarios, its memorable lines, and its lovable but silly charterers. Finally, this movie has some great music, too. We still bust up laughing at the "My Little Buttercup" scene, which is situationally funny to the point where we can reenact it move for move. Even the "Blue Shadows" campfire song is hilarious because of its intentional sound stage appearance and the sheer the level of randomness it has as animals from all over the desert seem to congregate in the one spot where our protagonists are wanting a restful night's sleep on the range. We absolutely love this movie and feel it has stood strong against the test of time, though we can understand that it takes time to get to know the level of brilliance we've come to understand over time. One year ago, we were watching: "Kindergarten Cop"